Here at Main Street we are focused on supporting our clients in understanding the valuation of personal property, handling the estate of a loved one, moving or "empty nesters" preparing to downsize. Our knowledgeable staff brings extensive resources and years of experience to the process of evaluating and selling personal property, antiques, furniture, art, pottery, glass and all other household items. You can always be confident that your best interests are our top priority. Whether your looking for property valuation or preparing to liquidate a whole or partial estate, our mission is to provide you with the very best guidance and the most professional services. 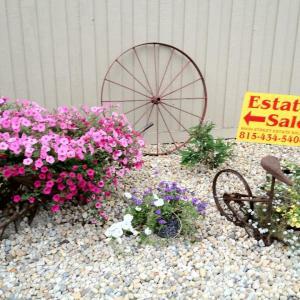 With some estates there just isn’t enough to warrant a sale. We offer whole and partial estate buyouts from entire household to single items. We can put in touch with other businesses who may be able to provide alternative options. Many times items are better suited for Auction. We can advice you when that would be the case. We accept consignments at our 15,000 sq foot Estate Liquidation Facility in Ottawa IL. We provide no obligation free consultations. We would be glad to meet with you and help out in any way we can. Sometimes an estate sale might not be right. We have options and solutions for any situation. We understand this can be an overwhelming task whether handling a loved ones estate, moving, or liquidating personal assets. Our goal is to make this difficult time as easy as possible and eliminate the stress and burden associated with such situations. Motorcycle & Motorbike parts, Advertising, Clark Forklift, Tire Balancer, Misc Tools, Large amount of Store Displays, Office Equipment, and much more. 100+ firearms, Early Colt's, Remington, Smith & Wesson, Winchesters, Rugers, WW1 & WW1 1911a1's, and much more. German Military Items, US Military Uniform collection, and much more. An amazing collection of 300 + syrups, toothpick collection, cake plates, tumblers, sugar shakers, EAPG, water pitchers, and misc glass primarily from 1850's-1890's. 100's of estate fresh antiques, primitives, and more. large mettlach stein collection, lladros, slot machine, tobacco jar collection, musical instruments, ink well collection, artwork and much more. 100's of machinist tools from a machinist estate. gages, blocks, cabinets, vintage to new. 160+ US Morgan Silver Dollars, Many Brilliant Uncirculated examples, Carson City Dollars, Key Dates, San Francisco Mints, overall a very nice collection. 200+ Ounces of silver bullion. 10 oz & 1 oz bars, 1 oz rounds, Silver American Eagles, Silver Canadian Maple Leafs, Art Bars, Art Rounds, and misc. bars. Main Street Estate Sales Presents another fine Sale! MAIN STREET ESTATE SALES PRESENTS ANOTHER FINE SALE.